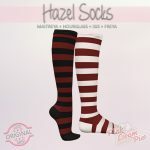 Marketplace Review on Hazel Stripe Socks [Sangria] Very nice socks! These fit under most shoes, (demo first), and come in flat and high. Textures are bright and clear. Love them!